Environmental conservation and pollution control are ongoing processes. 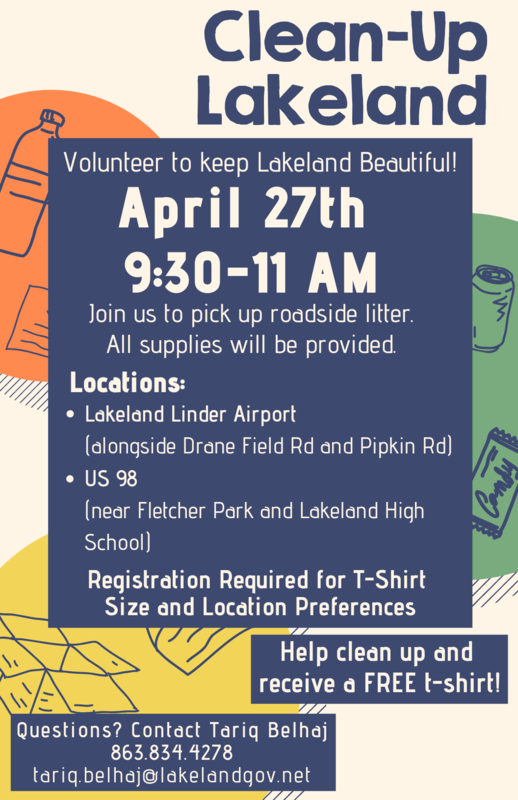 Help maintain a beautiful community by joining a group of staff and patron volunteers in an effort to clean up Lakeland by picking up roadside litter. There will be two locations: Lakeland Linder Airport (alongside Drane Field Rd and Pipkin Rd), and US 98 (near Fletcher Park and Lakeland High School). Gloves, trash-grabbers, and trash bags will all be provided courtesy of the Lakes and Stormwater Division of the City of Lakeland. Register below with your e-mail address and we will contact you about your preferred location and size for a free volunteer t-shirt! Please register by April 18th.